Novak Djokovic is without arguments, one of the world’s greatest Lawn Tennis player in history. The Serbian born professional Tennis player has the 4 major world titles (Australian, US, French, and Wimbledon Open) to his name, aligning himself with the other legends of the sports while becoming the 3rd man to hold the same 4 titles back to back to back. He is widely known and addressed by his hypocorism Djoker, or Nole. He has competed and won in different court championships like the Association of Tennis Professionals (ATP) Masters 1000, ATP World Tour 1000, ATP 500, the International Tennis Federation (ITF) World Championship tournaments, the Olympic 2008 and Tours Final Championships and he has been a recipient of various awards outside Lawn Tennis such as the Guinness World Record, Order of St. Sava and Order of the Republika Srpska and the list goes on. He was born to a Montenegrin father Srdan Djokovic and a Croatian mother Dijana Djokovic on 22nd May 1987 in Belgrade, Serbia. He has two younger brothers Marko and Djordje born in 1991 and 1995 respectively. Novak is not the only sports inclined individual in the family as they have a long history in sports. His father was a soccer player while his uncles and aunties were renown Skiing professionals and both his younger brothers are also aspiring professional tennis players. At the young age of 4, Novak Djokovic was discovered by a Yugoslavian tennis player Jelena Gencic in his family sport at Mount Kpaonik. Jelena seeing that the lad was heavy with potentials, obtained the parent’s permission in order to groom him; 6 years down the line, she discovered he was an outstanding player who needed better competitive grounds – a decision that informed Jelena Gencic reaching out to Nikola Pilic the owner of Pilic Tennis Academy in Germany, who took over the task of grooming the young Novak Djokovic from his age of 12 till he clocked 16 years. Two years after he had arrived Germany at the age of 14, he began playing in the European championships winning singles, doubles and team categories of the tournaments before he proceeded to the Junior Grand Slam tournament in the early 2000s, appearing in the semi-finals at the Australian Open. He made his pro debut in 2003 and since then, he has won not less than 14 single grand slams titles. He achieved a milestone in his career after he emerged victorious over the British favorite, Andy Murray in the 2011 Australian Open final match. The victory saw him replace the then world No. 1 on the rankings. In hos career, Novak Djokovik has won the Australian Open in the year 2008, 2011, 2012, 2013, 2015 and 2016; the French Open in 2016; the Wimbledon in 2011, 2014, 2015, 2018 and the US Open in 2011, 2015 and 2018. Furthermore, he has also played for his birth country’s national team representing them in the Beijing 2008 Olympics, securing a bronze in his solo outing for them. He has also won a total of 32 ATP Tour Masters titles, 5 ATP Finals, 12 titles of ATP World Tour 500, The Davies (2010) and he got to the finals of the Hopman competition in 2008 and 2013. 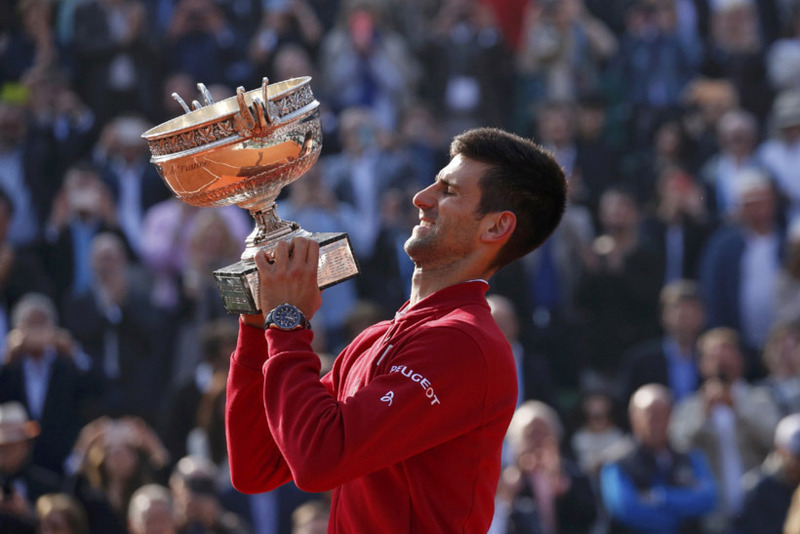 Novak Djokovic is widely regarded as the first male tennis player to have won 9 masters titles in Masters 1000 tournaments and he has also held down the No.1 spot for about 200 weeks with series of winning streaks characterizing his days on the court. The pro tennis player is not only all the tennis business, but he also makes out time to make hilarious jokes and imitates fellow tennis players like Roger Federer, Serena Williams among others, which earned him the moniker Djoker and has seen him appear on several television shows. The Serbian also founded a charitable organization Novak Djokovic Foundation in 2007, which is run by his dear wife Jelena to carter for less privileged children. The foundation has partnered with other organizations like the World Bank to donate generously to causes such as the $20,000 gifted the Melbourne City Mission Early childhood education scheme. The ace tennis player is one of the well-paid tennis players. There is a varying estimation of the star’s net worth but he is estimated to be well within $175.3 million or more. He rakes in an annual salary of $23.5 million, his average annual income is $48.5 million and he also has other personal investments in the tone of $152.8 million (most in real estates, food business, and sports apparels). He has a collection of exotic cars which includes a Mercedes Benz, Bentley, Aston Martins, and Audi among other car brands. Djokovic equally bought himself a luxurious house in 2014 in Monaco, Mount Carol. He has also earned mouth watering sponsorships and endorsement deals worth over $28 million from companies like; Jacob’s Creek, Peugeot, Lacoste, Head, Adidas, Japanese Clothing company Uniqlo, among others. Novak Djokovic in the past has been alleged to have been involved in affairs. He first dated Serbian pop star, Natasa Bekvalac and then Bollywood actress, Deepika Padukone. Other women he has been linked with includes the celebrity chef of Venus Williams, Lauren Von Der Pool, who herself came out to deny the allegation, stating they were only friends. She has on different occasions shared healthy food tips with the player since 2012. A Ukraine Blond lawyer Victoria and DJ Lady Lee a.k.a Lidija Popovic is not excluded from the list. Djokernole, as he is popularly nicknamed, is happily married to his beautiful wife Jelena Ristic Djokovic and they have 2 kids, a son Stefan who was born on 21st October 2014 and a daughter named Tara born on 2nd September 2017. The duo met in the high school and started dating in 2005. By 2013, they got engaged and signed the dotted lines of the marriage register on the 10th of July 2014 few days after Djokovic lifted the trophy at the Wimbledon. There were rumors of friction between the couple but they were unfounded as the pair are still waxing stronger daily in their marriage. He is athletically built, standing at a height of 6 ft 2 in (1.88 m), complemented by weight of 80 kilograms (176 lb) with his chest measuring 38 inches, biceps 13 inches and waist said to be 32 inches.